Google wants to cram as many baby monitoring devices as possible into a single crib. 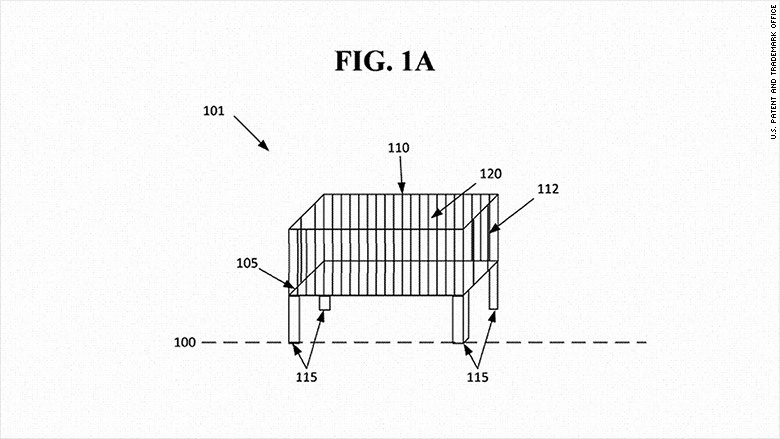 A patent published on Thursday showed the company's plans for a smart crib. A description of the invention states that various sensors and cameras will be embedded into different parts of the smart crib to keep track of things like the weight and movements of a child, as well as the room's temperature or carbon monoxide levels. Microphones on the crib would also allow caretakers to listen to a child's cries or chatter. "Because the sensors are integrated into the crib, they mitigate the risks involved in placing foreign objects near and/or in a baby crib," Google wrote in the application. What's more, the crib could also respond to the child. Parents could put an "entertainment device" into the crib and program it to play music or project a cartoon onto the ceiling if it detects that the child is crying, the company says. The patent was filed in late 2014, before Google was restructured as Alphabet (GOOGL). It's likely that the project will now fall under Nest, the company's smart home division. Nest recently replaced its CEO, installing Marwan Fawaz following turmoil with founder Tony Fadell. A Google spokesperson did not immediately respond to request for comment, but companies often file patents for products it may never produce.